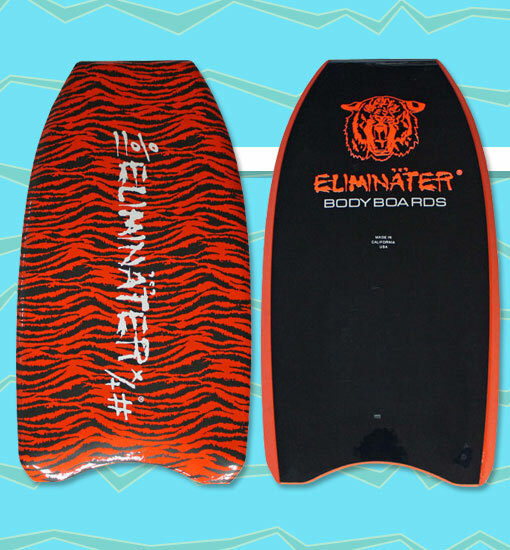 The Eliminater Hawaii Pro Model was easily recognizable by its vibrant tiger stripe design and the man-eating tiger pictured on the bottom. As for construction, the board featured an Arcel core, marine vinyl deck, and a rigid vinyl bottom. During this era, many bodyboard manufacturers were beginning to favor 50/50 rails. Eliminater was no exception, featuring 50/50 rails on all their bodyboards.